Fortunée returned to formal schooling to complete her Honours Degree in Fine Arts at the University of Ottawa. This achievement later in life, has inspired her to grow in new directions and explore her artistic muse with great inventiveness and determination. An exchange trip to Japan in 2009 was the inspiration for a series featuring a new technique of hand painting Japanese paper, tearing the sheets into random pieces and applying them to a canvas, with both an abstract and a highly realistic result. A subsequent body of work, “Impressions of Impressionism” uses some of the same paper processes, with a step towards realism, after an inspirational trip to the gardens of Monet in France. Fortunée traced the paths of the Impressionists, seeing what inspired them, through her own eyes and interpretations. Searching for relationships in colour and spontaneous expression in her interpretation of the world, Fortunée’s work is emotional and textured and influenced by deeply felt personal beliefs and/or memories. In her work, Fortunée expresses and portrays human desires, hopes, passion and things ephemeral. The achievement of a Bachelor of Fine Arts degree while raising a family, has inspired her to grow in new directions and explore her artistic muse with great inventiveness and determination. Motivation, self-discipline, inquisitiveness and life experience have propelled her to search for novel ways to express her creativity. She responds sensitively to the nature of her chosen medium. Fortunée has exhibited her work in solo and group shows in many galleries and other public spaces . Her paintings are on display in private collections and institutions in Canada, the US, England, Israel and Sweden. The design and production of the covers of the book “A Common Thread”, an interview on CBC’s “All in a Day”, numerous newspaper articles and an extensive list of painting donations and commissions to a variety of causes, rounds out her resumé. The miracle of life parallels the miracle of nature. They walk the same path. These are subjects I explore in my work, the unpredictability of life, the chaos, and the sublime beauty. The mysteries of nature and its energies propel me in my artistic search. Whether the paintings are purely abstract or not, I attempt to come to grips with the life force within me which fuels my passion, in relation to the images expressed on the surface of the canvas. Memories, perceptions and personal beliefs help shape my attitudes and motivate me to explore various issues through painting. As I work, subconscious layers of memories reveal themselves as they search for their own meaning. A progression has evolved over the last number of years, beginning with a new technique using Japanese washi papers which I hand painted. The Japan Series allowed me to let go of any previous need to conform, restrict or manipulate, and to explore unconventional ideas about the process of creation. This “torn paper” art represents the unpredictability and fragility of action, the combination of disconnected and overlapping thoughts, and the transparency of new vocabulary as it emerges in the creative process. The unrestricted paper image formations are at once calming and freeing, yet invite an unquenchable urge to rip and tear and reconstruct, before putting the pieces back together. Combining this paper medium with acrylics became the basis of a subsequent series. 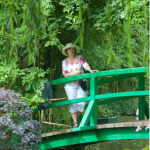 From the incredible gardens of Monet, to the asylum where Van Gogh rested and painted, I became intensely inspired to create my own Impressions of Impressionism. 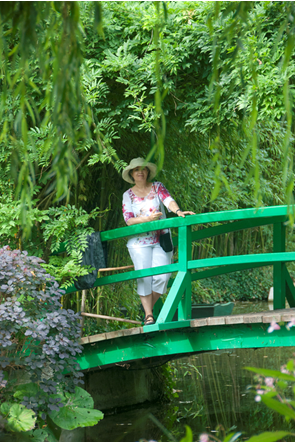 Following the paths of the Impressionist painters through France, and having lived in Paris as a young girl, I reconnected with the light. A light which somehow beckoned and insisted upon closer inspection of the natural world. It’s impact on me was revelatory. Searching for relationships in colour and spontaneous expression in my interpretation of the world, I myself feel emotional and textured. Often there are strong narrative elements stemming from deeply felt personal beliefs or memories. I try to portray and express human desires, hopes, passion and the fleeting moments of life. As my work progresses through many stages, the result is a joyful exploration of colour, shape and form.